Giving birth to live young is one of the traits we use to distinguish mammals from other animals. But certain kinds of lizards, snakes and amphibians, both living and extinct, also reproduce without laying eggs. In fact, live birth (or viviparity) has evolved more than 100 separate times in non-mammal species throughout history. It seems to have been a common reproductive strategy in particular for extinct aquatic reptiles, such as the fish-like ichthyosaurs, plesiosaurs and mosasaurs that lived at the same time as the dinosaurs. But one group of animals known as Archosauromorpha, which include crocodiles, birds and their ancestors the dinosaurs, has never been known to give birth – until now. A recently unearthed fossil, described in a new study by a team of scientists from China, the US, UK and Australia, shows that an ancient species of archosauromorph was giving birth around 245m years ago. The newly described specimen belongs to the species Dinocephalosaurus orientalis and was found in sediments from the early Triassic period in Yunnan Province, China. Dinocephalosaurus had a body length of around a metre but with an elongated neck of nearly twice that length. Its skull was relatively small and equipped with needle-like teeth adapted to catch fish and squids. The shape of its skeleton suggests that it lived in water, but scientists originally thought it might have ventured onto land to lay eggs, as all known archosauromorphs do. The new fossil find now proves this theory to be wrong because it was found with an embryo preserved in its abdominal region. This provides compelling evidence for that this species of archosauromorphs gave birth to live young. It is often hard to reconstruct a picture of an extinct creature and how it lived from a fossil, but a number of features strongly suggest that the new specimen does indeed represent a pregnant Dinocephalosaurus. The embryo’s skeleton has a very similar shape to the adult’s, showing that both belonged to the same species and that the embryo was in a very mature stage. The embryo is fully enclosed by the bones of the adult specimen and located in the pelvic region. Remains of a partially digested fish were also found further up and between the ribs of the adult. This not only helps us identify the mother’s last meal, but also rules out the possibility that the embryo might have been devoured prey. The embryo was also found in a curled-up position with the neck pointed towards the chest and forelimbs, which is a typical pose for vertebrate embryos. The withering of soft tissues such as muscles after an adult vertebrate dies means they are often fossilised in a typical death pose with the neck and tail arched back. In this case, the mother animal was preserved in exactly this position but not the embryo. This makes it unlikely that both fossils died at different times and came to lie on top of each other by coincidence. Together, this provides good evidence that the new fossil is indeed that of a pregnant Dinocephalosaurus and its embryo. Exceptionally preserved fossils, such as this one, allow a unique glimpse into the life of organisms over 245m years ago, but they also have more far-reaching implications. Until now, it was assumed that all Archosauromorpha laid eggs. Modern members, represented by birds and crocodiles, are without exception oviparous (egg-laying), and fossilised eggs of dinosaurs and pterosaurs further supported this assumption. Finding a pregnant Dinocephalosaurus demonstrates that at least some extinct archosauromorphs were giving birth to living young. It also means our knowledge of how archosauromorphs reproduced goes back 50m years further than was previously possible. 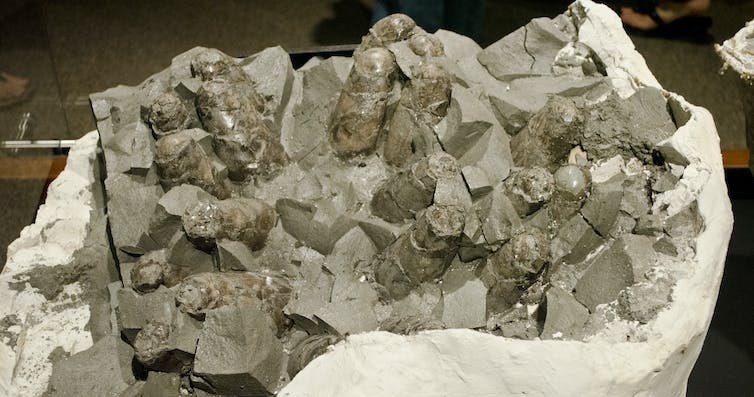 Until now, our oldest relevant fossils of this group were dinosaur eggs from the early Jurassic period (around 190m years ago). The results of this study also raise several questions. Viviparity has evolved independently and numerous times in all major types of vertebrate, with mammals probably the most prominent and successful example. Although giving birth is physically and energetically taxing for the parent, it has clear advantages for the offspring, which receives extra nutrients and protection, and develops without being affected by environmental conditions. Yet archosauromorphs evolved away from this reproductive strategy to become the egg-laying dinosaurs, and eventually crocodiles and birds that we know. Why was this? We will now have to hope that future fossil finds might reveal another piece to the evolutionary puzzle.